Find the perfect gift for any Flutist! Our Flute Jewelry is fashioned from castings of original Flute keys and is made by local Flute Artisan, Ellen Burr. 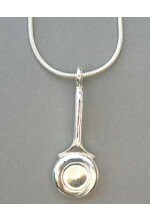 Each sterling silver piece is hand finished and beautifully crafted. Wear your Flute and only those in the "know" will know!! Choose from several different styles - necklaces & earrings! If you would like something that is not featured on our website, please feel free to email or call. 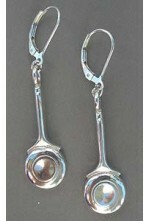 C Key Earrings A beautiful set of sterling silver trill keys on sterling silver ear wire! 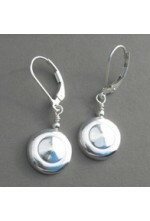 Specially marked at 2005 silver price! ..
Sterling Silver C Key Pendant A beautiful single C key on a snake chain necklace. 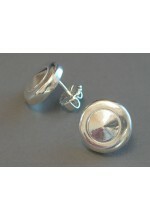 Specially marked at 2005 silver price! 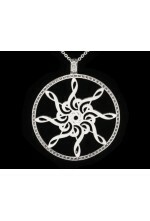 Available on a 16 or 18inch chain! ..
Long Trill Key Earrings with Gem Stones Gorgeous Sterling silver trill keys set with a 5mm semi-precious gem on sterling silver ear wire! Choose from these beautiful gems: Rhodolite, Garnet, Amethyst, Blue topaz, Citrine, Peridot ~ $179 Pink Tourmaline, Green tourmaline ~ $2..
Open Hole on Rubber Cord A beautiful sterling silver open hole key attaches to a tube bail. 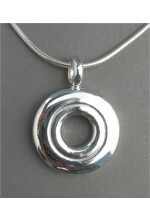 Comes in a 16, 18 or 20-inch length ..
Open Hole Pendant This gorgeous open hole sterling silver key hangs on a 16" snake chain. 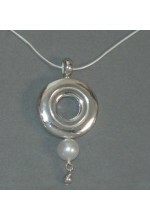 Also available in a 18'' chain by special order ..
Open Hole Single Pearl A beautiful single 7mm cultured freshwater pearl that hangs from a sterling silver open hole key. .. Tiny Trill Key Earrings This beautiful sterling silver key dangles from a small silver ball on sterling silver latch back ear wires .. Tiny Trill Post Earrings These delicate sterling silver earrings are perfect for a subtle statement ..
Treble Clef Necklace Inspired by a Treble Clef symbol, this beautiful necklace is made of Sterling Silver. Measuring at 1 1/4" wide by 1 3/8" high with an 18" Sterling Silver chain, this is a great addition to any music lovers wardrobe! ..